Ghana is to get a $600m three-year loan from the International Monetary Fund (IMF), amid concerns about the impact of the recession on poorer countries. It will also be able to draw up to $450m from the IMF through a special facility - expanded after the G20 summit - to help poor countries. Ghana needs funds to reduce its budget deficit and support its currency. It has been hit by high food and fuel prices, an energy crisis and heavy spending before last year's elections. But the Ghanaian economy has proved "relatively resilient," the IMF said, supported by the high prices of cocoa and gold. The extra $450m will come from the money that Ghana and others have deposited in the fund. These are held as special drawing rights, a basket of currencies composed of the dollar, euro, yen and pound. Ghana is the world's second-biggest cocoa producer, Africa's second-biggest gold exporter, and is also set to become the continent's newest oil producer. The IMF funds should help the country reduce its budget deficit from 14.5% in 2008 to 9.4% in 2009. Spending has risen in recent years. In 2006/07, poor rains meant that Ghana, which relies mostly on hydropower, had to rely on more expensive oil-fired power. Rising fuel and food prices also hit Ghana hard. In the run up to last year's fiercely-contested election, the government also spent heavily. If Ghana is to reach its budget deficit target of 4.5% of GDP in 2011, much more needs to be done to control spending, the IMF said. It needs to strengthen tax collection, keep the public sector wage bill under control and avoid large subsidies for petrol and utility bills, it said. If this advice is followed, this will likely mean higher electricity and fuel bills for Ghanaians. But Ghana's economy should receive a welcome boost from oil. 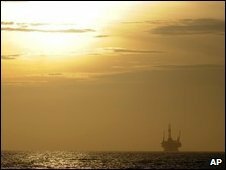 In 2007, Tullow Oil announced that it had discovered 600 million barrels of oil offshore. Oil revenues, expected to start in 2011, could potentially bring Ghana into middle income status, Takatoshi Kato, the IMF's deputy managing director, said. But he added: "The horizon for oil production could prove relatively short, and it will be important that the new revenues be used wisely." Mr Kato's views echo analysts' fears that Ghana may fall prey to the resource curse. An influx of oil dollars can deter countries from diversifying into other economic sectors. In countries where institutions are weak and governance poor, oil riches can also exacerbate corruption. Poverty and corruption are rife in oil producers such as Nigeria, Equatorial Guinea and Angola. The IMF has calculated that oil income to the budget will be worth about $40 per person in 2011, less than $1 a week. "That will make some differences to living standards in Ghana but not of a magnitude that you can afford to use it imprudently, and you need very strong budget mechanisms to make sure that money ends up in programmes where money is needed," Peter Allum, the IMF's mission chief to Ghana, said.